Why purchase individual components from multiple vendors, when Tri-Mack can supply finished assemblies? Tri-Mack has the ability to provide fully finished and tested assemblies and kits, saving you time and money. Tri-Mack is NADCAP certified for composite bonding and we assemble critical components using thermoset film adhesives in our Class 10,000 equivalent clean room. We also have epoxy and RTV bonding cells in both our Main Plant and Advanced Composites Center. We utilize best practices in our prep and bonding procedures to ensure the highest quality parts. In addition to riveting and other means of mechanical assembly, Tri-Mack also offers ultrasonic welding and insertion. This process uses sound waves to create friction between components, locally melting the thermoplastic for the joining of two pieces or the insertion of metallic bushings. Tri-Mack can provide functional testing for your precision plastic components as well. These include torque, load and leak testing. Tri-Mack is also equipped to provide a range of electrical testing, including resistance, continuity and hi-pot. 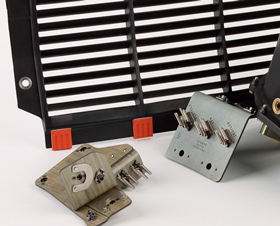 Tri-Mack provides part marking per customer specifications using the best process for your component: in-mold marking, laser engraving, CNC engraving or dot peen. We can work with you to establish part kits, enabling you to consolidate your ordering and receiving to a single part number. We supply kits in single-use recyclable containers or reusable totes and work to our customer’s Kanban shipping systems. Tri-Mack has OEM-certified DSQRs, enabling us to ship directly to stock for many of our customers.